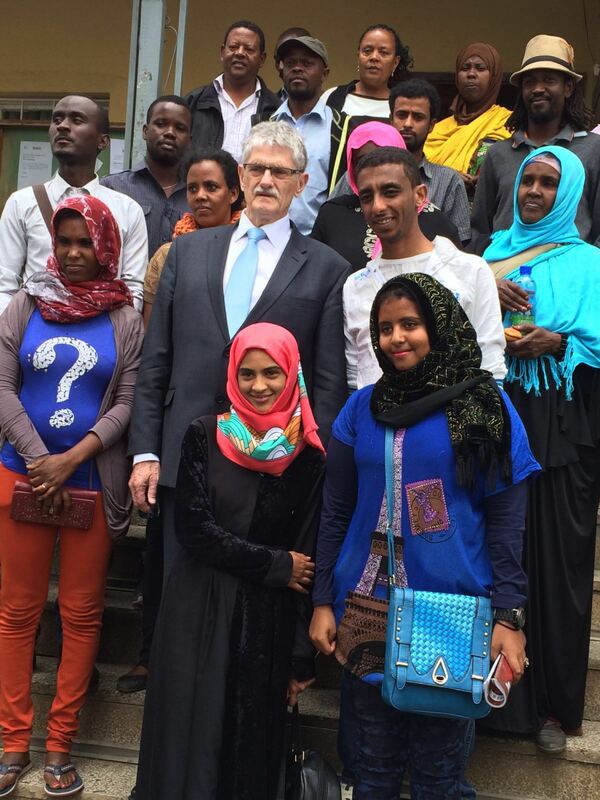 The President of the UN General Assembly Mogens Lykketoft sat with refugees from Burundi, Eritrea, Somalia, Sudan and Yemen today as they described their harrowing journeys to seek asylum in Ethiopia and also their difficulties living in Addis Ababa without being allowed to work. One young mother of seven children from Burundi spoke of losing the husband that had at times physically carried her on their journey to seek asylum. Breaking down in tears, the woman begged the President to help raise awareness about the situation of refugees as they wait for resettlement in other countries. Another woman described being beaten and burned in Sudan before fleeing with her husband and child to Ethiopia six months ago. She expressed her gratitude to the Ethiopian government and people for giving her family asylum as well as a basic crutch for her damaged leg. The President was visiting the Jesuit Refugee Service Centre in Addis Ababa which provides basic services to some of the 7,600 registered asylum seekers living in the Ethiopian capital. Services on offer include courses in English, computer software and music, a day care and playground facilities for children. At a small emergency centre, a staff member offers referral, counselling and basic support to refugees in desperate situations. Nearby refugees cook meals at “refugee café” and others catch up on their e mails and Facebook accounts at a row of computers enabling them to surf the internet for 30 minutes each. After taking a group photograph with the refugees he met, the President thanked them for sharing their stories and helping him better understand their needs. “We have to do more for you. I will bring your stories back with me to the United Nations. But I can assure you that your situation and problems are known and are at the very core of what we at the UN are trying to deal with better,” he told them. Atakelt Tesfay, Country Director for the Jesuit Refugee Service in Ethiopia, thanked the President for his time and interest in learning more about the current refugee situation in Ethiopia.